Before Mark McGwire, Barry Bonds, and Sammy Sosa, there was Roger Maris, the reluctant home run king who electrified the baseball world with one of the most unforgettable seasons the sport has ever known. Born in Hibbing, Minnesota, and raised in Fargo, North Dakota, Maris was a small-town boy who unwillingly became a New York Yankee when he was traded by the Kansas City Athletics. Almost immediately, he was thrust into the glare of the big-city lights and found himself pursuing one of the most prestigious and most celebrated of all baseball records: Babe Ruth's single-season home run mark of 60, set in 1927. Thirty-four years later, Maris joylessly was drawn into the chase and found himself the eye in a storm of controversy. He became the center of attention he never sought and the recipient of a celebrity he didn't want. As a young sportswriter, Phil Pepe joined the fray on August 2, when he took over as the Yankees beat writer for the New York World-Telegram & Sun, and he covered Maris' race for the record to the very end. Here is his firsthand account of that historic home run challenge and the man that conquered it. Phil Pepe was a New York Yankees beat writer for the New York World-Telegram & Sun in 1961, where he covered Roger Maris' race for the single season home run record. He was the Yankees beat writer for the New York Daily News from 1968 through 1981 and is a past president of the Baseball Writers Association of America. 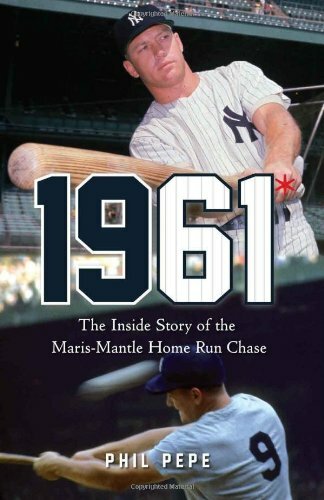 He is the author of more than 50 books on sports, including a biography of Yogi Berra and collaborations with Yankees legends Mickey Mantle, Billy Martin, and Whitey Ford.